People lose their teeth for a variety of reasons – from lack of oral hygiene to painful accidents. If you want a quick fix for missing teeth, instant dentures in India might be your low cost-high value option. The presence of top notch dental facilities and well-trained dentists are the leading reasons why people choose to get teeth implants in India. According to the National Institute of Dental and Craniofacial Research, American adults between the ages of 20-64 have an average of 24.92 remaining teeth out of a total of 32 while 3.75% of the same group has lost all their teeth. Add to this rate of teeth loss, the rising cost of dental care in the U.S. and there lies the reason why patients are exploring the option of dental tourism in India. A denture is a prosthetic removable device that acts as replacement for missing teeth and surrounding tissues. There are two types of dentures: complete and partial. Complete dentures are utilized if the patient is missing all the teeth, while partial dentures are recommended when some natural teeth remain. As the name indicates, immediate or instant dentures can be placed as soon as the tooth has been removed. They are made in advance and it allows the patient to have replacement teeth immediately instead of waiting 8-12 weeks for the healing to occur. Instant dentures do require adjustment since gums and bone shrink while healing. So instant dentures are considered temporary options that act as fillers till more conventional dentures can be made. The advantage of instant dentures is that you walk out of the dentists’ office with a set of beautiful and natural looking teeth that allow you to eat, speak and smile without any trouble. 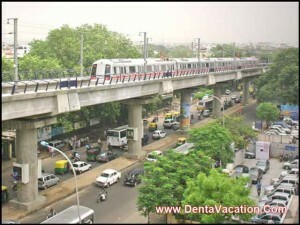 So get artificial teeth in India in a day and you can return the welcoming smiles of Indian people without hesitation! 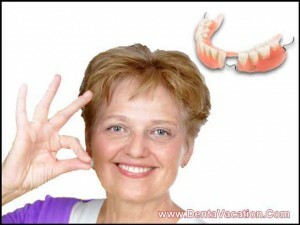 Why Get Instant Dentures in India? India is the land of contrasts. A blend of the traditional and the modern, the country has slowly but surely emerged to become a leading medical tourism destination. According to India’s hospitals are collaborating with internationally renowned hospitals to provide top of the line services including the increasingly popular immediate dentures in India. There are many advantages to getting instant dentures in India. For most people, money is the leading determinant in their consideration for any medical or dental procedure. So getting low-priced dentures in a day in India is a boon to many people given that it can cost as little as 10% of American prices! Other leading procedures such as all on 4 implants in India all come at jaw dropping low prices. It is very important to remember that the low cost of same day dentures in India does not reflect low quality of medical care or services since state-of-the-art technology is available to dentists in the leading hospitals and clinics in India. These globally competitive dental centers are run by well-trained and certified dental professionals, who will delight you with their quick work as they provide denture in an hour in India. You will rarely find a language barrier during your procedure for instant dentures in India as majority of the dental doctors and their staff can speak English. There is virtually no waiting for your appointment for dental treatment in India. After getting your low cost instant dentures in India, use your time of recuperation to enjoy the sights and sounds of the city you choose. If you immerse yourself in India, you will hear the melody and rhythm in the cacophony that defines the country. Make sure you understand the ins and outs of your contract for getting low cost instant dentures in India since liability laws apply very differently there as compared to the U.S., the U.K. or other western countries. Make sure you discuss the actual length of stay required with your attending dentist, even though you are getting immediate dentures in India. Many of India’s hospitals have accreditation from organizations such as the ISO and JCI. Make sure the dental clinic providing you with artificial teeth in India in a day is properly certified. Indian high end retail and hospitality establishments will accept international credit cards and travelers checks. But you must carry Indian currency to get by at the local stores and markets. Beware of pickpockets. While India is a progressive nation, it is best to dress conservatively. Be respectful of religious sentiments. Drink bottled water and avoid street foods. Venturing out alone after dark is not advisable. India is country of varied weather and temperature. Check the forecast and pack accordingly. Getting instant dentures in India in beautifully appointed and well managed dental clinics with knowledgeable dentists at rock bottom prices should be reason enough to travel so far. Add to this the sights, smells and sounds that enrich the layers of culture, cuisine and architecture of India, and you have found the reasons to flash beautiful smiles with your new teeth! DentaVacation facilitates low-cost Instant Dentures in India. Get FREE Quote and claim your FREE Dental Tourism Guide from DentaVacation.